We present Pump Casing with perfect care for various types of pumps are manufactured by us in “C.I, CAST STEEL, S.S 316, S.S 304, S.S 410, BRONZE (G.M), Ph. BRONZE, and WCB.” These casings are available in different specifications as demanded by our esteemed customers. As these Pump casing are made from optimum quality raw materials, the Pump Casing offered has gained popularity. 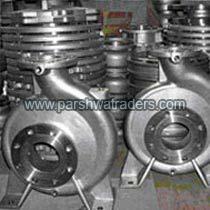 We are named as one of the leading Pump Casing Manufacturers and Pump Casing Suppliers from India.